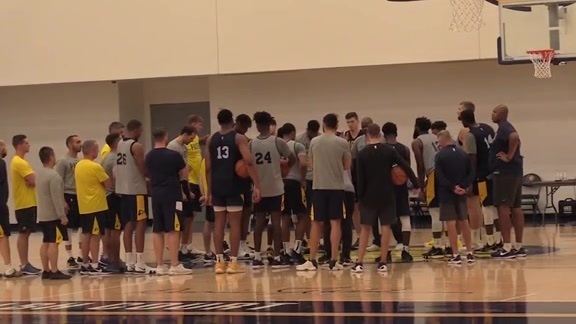 September 28, 2018 - At training camp on Friday, Pacers point guard Darren Collison talked about working the new players into the rotation. Kyle O'Quinn explained why he trimmed some pounds over the offseason. And Pacers head coach Nate McMillan addressed Thaddeus Young's status, who has sat out practice with a foot injury. 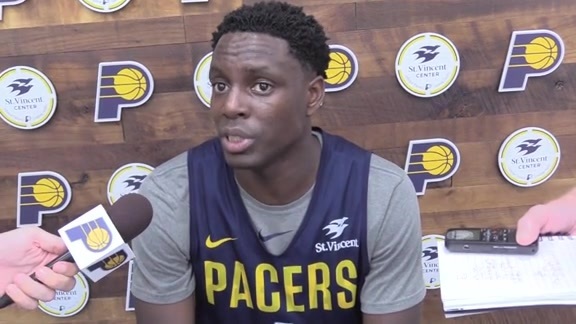 Sept. 28, 2018 - After four days of training camp, Pacers point guard Darren Collison shares his thoughts on free agent signings Tyreke Evans, Doug McDermott, and Kyle O'Quinn, and first-round pick Aaron Holiday. You'd think it would be simple. Big guy jogs out to the perimeter, plants his feet and waits for a small guy to dribble right by him in an attempt to brush off the defender. And yet, relatively few NBA centers and power forwards know how to set a proper screen for a pick-and-roll. Or, more likely, they know perfectly well how to do it, they just don't care to do it. Not over and over again, anyway. All those collisions take their toll after a while, even the virtual fender-benders. "A lot of guys don't want to give up their bodies," said Pacers coach Nate McMillan, who has seen a few picks and rolls in his 12 seasons as an NBA player and 14 as an NBA head coach. "That's a physical part of the game, giving up your body and saying, 'Run into me.'" Kyle O'Quinn says that, in so many words at least, without flinching. 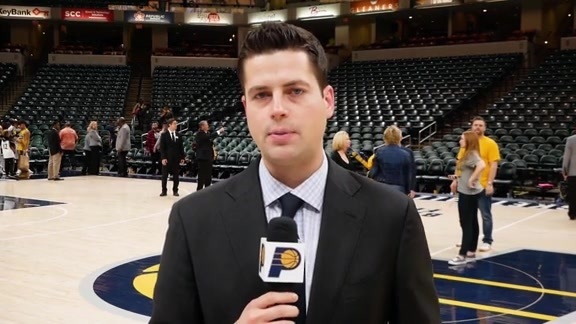 Said it in fact to president of basketball operations Kevin Pritchard when they met for dinner back in June, before O'Quinn signed a one-year contract with the Pacers. "He said," Pritchard recalled, "'What I really like to do is go set a screen.' He goes, 'If you think Victor (Oladipo) and Tyreke (Evans) got open before, I'm going to get them open." O'Quinn is listed at 6-foot-10 and 250 pounds. He looks slimmer than in past seasons, not that anyone in Indianapolis had been intently studying his body fat during his previous three seasons in New York, but he admitted only to losing "a couple" of pounds. Regardless, he's plenty big enough to continue setting screens. That might not sound like a topic worthy of discussion, but in today's NBA, which is often declared "a pick-and-roll league," it's nearly as important as assists and made shots. Because so many of the assists and made shots come as the result of screens. The NBA has been filled with effective screeners for at least 50 years. Thick centers dating back to Wayne Embry and Wes Unseld in the Sixties have planted themselves near the foul line and tried to knock defending guards out of position so teammates could find an opening. McMillan recalls classic executioners of the practice such as Maurice Lucas, Clemon Johnson and Xavier McDaniel from her era. Karl Malone and John Stockton were so effective with their pick and rolls that "Stockton to Malone" became a part of NBA lingo. Perimeter screens are a bigger part of today's game than ever, though, and are an essential part of any halfcourt offense. As 3-point shooters have improved, offenses have become more perimeter-oriented. The old inside-out attacks (such as those the Pacers utilized with Rik Smits or Jermaine O'Neal) in which teams dropped a pass into the low post, tried to draw a double-team, then kicked the ball back out to an open shooter, gradually disappeared. It's no wonder, with so many players shooting better than 40 percent from the 3-point line, about as well as centers were shooting on defended shots in the low post. "You've got to guard the 3-point line like you had to guard the post years ago," McMillan said. "Probably over 90 percent of your sets are going to be starting with a screen, trying to force the defense to make a decision somewhere." Screening isn't much fun, though. Those who do it well and do it willingly have a certain personality, similar to an offensive lineman in football. You're sacrificing your body to get a teammate free to score or set up someone else to score. McMillan tells his players that if one of them is open everyone is open, because the defense has to scramble to cover. And the best way to get one player open in the halfcourt is with a bone-jarring screen. The problem is finding someone to do the dirty work. Domantas Sabonis established himself as an effective pick-and-roll instigator with Lance Stephenson last season, but O'Quinn is poised to take it to another level. 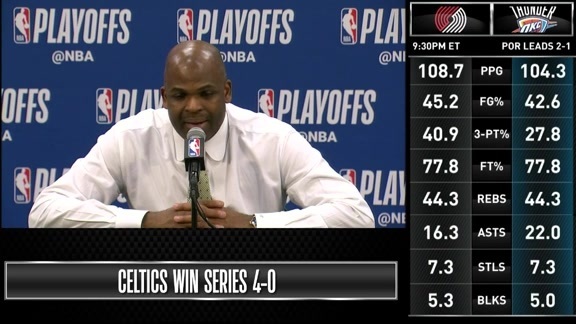 "We haven't charted that, but guys could set 50-100 screens a game, depending on how many minutes they play," McMillan said. "When a guy is running at you full-speed and guards are busting through trying to get over that screen, or through that screen, it requires you to take that contact. And then be able to do it again. "He has the body to do that, he has the mindset to do that. It's somewhat old school, the way he plays and how physical he plays. That's something that can rub off on your team. We need that; we want that. We like how physical he plays in the paint. "We had an opportunity to see that last year in New York when we were there and he kicked us a couple of times, and he's certainly bringing that into our training camp." His teammates have noticed – particularly Darren Collison, who has spent time with NBA Hall of Famer Steve Nash the past couple of off-seasons for tutoring on running a pick-and-roll from the guard's perspective. Point guards appreciate good screens more than anyone. "I didn't realize he was such a good pick-setter," Collison said. "His ability to get the guards open and his ability to pass, too, has impressed me. "It's a want-to. It's a mental thing. If you want to get your guys open you'll get your guys open. You've got to love physicality. If I was a big I don't know if I would set that many picks." O'Quinn does because he has a generous nature, which can be seen in YouTube videos from his seasons in New York. But he's also well aware of the subtle selfish reasons for being unselfish. Setting a good screen is an avenue toward playing time. It's also a way to get open for a shot if his defender leaves to guard the ballhandler. "The only way I can get open is if I open up someone else," he said. "I don't think Coach is going to call an iso for me this season. If I screen to get somebody open, potentially that's my opportunity to touch the rock."